Who's trying to escape your house or backseat? Wildly Attacking Crazed Feline Backseat Driver Car or House Static Vinyl Cling. Fun for Halloween or anytime. Clings to glass, mirrors and most smooth non-porous surfaces. Your backseat driver is going bezerk, trying to GET OUT... Watch passersby do a double take when they see who is clinging to your back seat side or rear window! 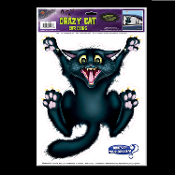 This hilariously funny and realistic crazy kitty static car window cling image of a near life-size black cat, will give your backseat the appearance of having a freaked out occupant... This hysterically funny conversation piece gets plenty of attention! Not just for cars... place in front windows, bathroom mirrors or shower doors, anywhere you want an unexpected surprise for friends and family members! Full color, re-usable, removable, repositionable decals. Clings use static to adhere to most smooth surfaces, such as windows and mirrors, without using tape or adhesive. PVC static clings adhere to windows and mirrors without tape or other adhesive; simply press and smooth! Will not stain or leave a sticky residue. One sheet, 12-inch w x 17-inch h (30cm x 42.5cm). Each figure image measures approx. 13.5-inch high x 11-inch wide (33.75cm x 27.5cm).